Born in Salt Lake City, Utah, Anthony attended the Taft School in Watertown , Connecticut after moving eight times back and forth across the United Sates, followed by Cornell University and the Skowhegan School of Sculpture and Painting. He then built a post and beam house from onsite wood on a mountaintop in rural New Hampshire with the help of his brother Patrick and painted watercolors and had several one man shows in Boston. A sense of unease in both the isolation and the subject matter of his paintings resulted in the selling of the house and a move to Manhattan. His new, part time occupation of erecting steel shelving for the storage of office records resulted in the discovery of a new medium, metal. Further exploration combined with previous interests in the wind and movement led to the making of kinetic wind sculptures. He then strung discarded elevator cables across local rooftops onto which he hung his first series of wind powered sculptures. After several one man shows in New York City and assorted group shows Anthony concluded in 1994 he would best be served by starting his own sculpture park and selling directly to customers. His answer to the notions of inclusiveness in the "art" world has been to invent his own and thereby be entirely free of any of its many conventions. He now lives on Orcas Island, Washington, with his business partner wife, Lynne. His work has sold works to hundreds of private collections from the Middle East to California, and many places in between. It has been showcased in palaces, sculpture parks, and the Barneys Christmas window in Manhattan. He designed the cauldrons for the Brazil Rio Olympics; one for the opening ceremonies and another, permanent, outdoor version that resides in the downtown section of Rio. Recently the work "Lucea" provided a backdrop to Auli'i Cravalho singing "How Far I'll Go" in the 49th Academy Awards Ceremony. Anthony is available for consulting on large scale commissions only. His process keeps him working through the nights in his remote island studio. 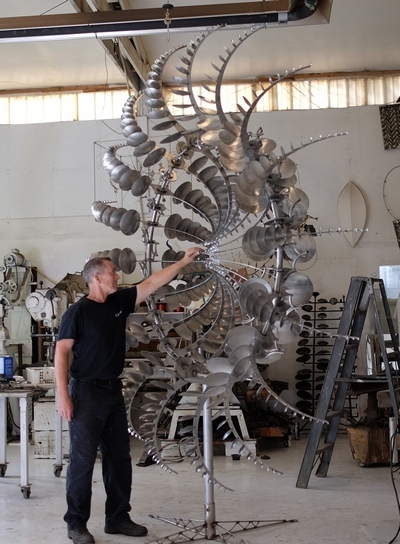 He designs and makes the majority of all his sculptures without the help of any assistants whatsoever with the exception of some recent large scale works fabricated by the Walla Walla Foundry, Show Canada and Huttinger of Germany.